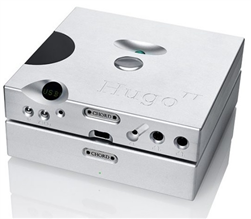 The addition of TToby, enables owners of the Hugo TT to fully exploit the device as a ‘digital preamp’, effortlessly driving a wide variety of loudspeakers, large or small, in addition to the Hugo TT’s headphone prowess. The TToby is a Class AB design that delivers 60 watts into an 8 ohm load and 120 watts into 4. It includes both an unbalanced and balanced input, to take advantage of the Hugo TT’s XLR output. TToby is in stock in black and silver finish.